The yellow pages are a tried and tested form of advertising that have brought in new customers and helped old customers find your number for years. However, with the growth of Google, other search engines, and review companies, many consumers have started ditching the phone book. But before you pull your yellow page ads, let Contractor 20/20 help you determine if they are working to your benefit or if they could be working better. Are your yellow page ads working? To determine whether or not your yellow page ad(s) is attracting new customers effectively, we perform a yellow page results analysis. Based on the results we are able to determine your yellow pages new customer cost. The experts at Contractor 20/20 have surveyed over 250 plumbing companies and have charted their yellow page new customer cost and found it to be as low as $23 and as high as $480. Normally, most companies have a new customer cost around $100. Once we know your yellow page new customer cost, we can help you compare your new customer cost to others in your industry and determine if it is too high. If it is too high, and not worth the cost, then we can start testing direct mail pieces, google ad word campaigns, or other forms of advertising, to determine which forms of marketing would be most cost-effective. If you decide to ditch yellow page advertising, it is important to have another substitute for leads in place. It is true that the industry has been over-dependent on yellow page advertising for too long. However, some companies are dropping their yellow page advertising before they test its real value or have a cost-effective and consistent substitute for future leads in place. 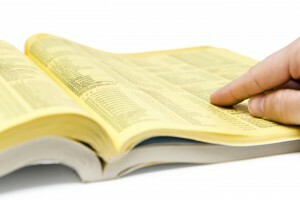 Improving your yellow page ad(s). Sometimes yellow page advertising isn’t working because the ad needs to be redesigned. HVAC and Plumbing yellow page ads that are generating a new customer cost of $50 or lower fell into four very similar designs. They normally feature one main point having to do with price, speed of service, or trust. Also, we have found that wordy ads do well in upscale areas and college towns, but do terrible in average working class areas. The bottom line here is that design matters. Contractor 20/20 has seen companies change the design of their yellow page ad and triple their results. We’ve also seen them lose 70% of the results by going from a good design to a bad one. If, after our analysis, we determine that your yellow page advertising is worth the cost, but the new customer cost is higher than it should be, we can help you redesign your ad so it is more successful. Yellow Page advertising still works and can be an effective way to reach new customers if you are in the right market with the right ad. Let Contractor 20/20 help you determine if it is worth the investment.